Crazy Eights - thanoscardgamess jimdo page! Crazy Eights is an easy popular matching game for all ages. The objective is to get rid of all the cards. One standard deck is used, dealing five cards clockwise to each player. The undealt stock is left on a pile, the first one is turned face up as the starting card. The game starts clockwise. From then on, each player, at his turn, tries to follow the top card, by discarding either a card of the same suit or of the same rank. The discarded cards are piled up, and the card on top is always kept open. This is a suite of four relevant games: the classic US game of Crazy Eights, the French game Huit Americain, the Greek game of Agonia, the advanced version of the latter, the Illustrated Agonia (a challenging variant) and the Turkish game of Pis Yedili. 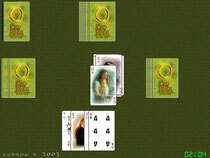 Three card decks are available to play with (including a Turkish one and a 'Lord of the Rings' theme deck).